An interesting piece with an error. In Australia the small stores maintained their market share after the abolition of fixed pricing in 1972 and ultimately nearly 40 years later it is the discounters that have closed there are probably more small stores than ever before. That is no reason for complacency or smugness however as the market is under threat of contraction, and that is the real issue.. fewer people are using their discretionary spend on the humble book. Book prices at RRP in this country have been high in international terms before and after the abolition. It’s a nonsense that protecting the the profits of what were almost all exclusively International publishers back in 1972 kept the prices down. It remains a nonsense now. Very interesting and well written view from the outside, highlighting the situation over here. Thanks! It’s certainly true: While hampering the advent of ebooks in Germany, the Buchpreisbindung is – for the time being – saving the smaller bookstores from sudden decline. Mind you: Times are getting harder and harder for the small shops here, too, even without the rise of ebooks and ereaders. And many had to strike sail during the last years already. Bill Morris is a f**king genius. I live in Germany and Mr. Morris did a great job describing the situation here. Great essay – very insightful. We have to realize that some things are worth preserving — and paying for! Nice that an outsider can have these insights into the German culture of books and reading. As a German living in New York, I would even go so far as to say Germany is in general a more enlightened country than America – may it be recycling, health insurance, taxing the rich. All Germans believe in evolution, pay a lot for gas… you name it …., but then, why is life in barbaric America so much more interesting than life in Germany? Thank you very very much for this article, because we Germans are also very good at whining, especially the booksellers! The problem is, although it is illegal, they sell their books cheaper to the big chain-stores than to the smaller ones. So although the reader pays the same price, not all booksellers earn the same. ‘The German Solution’? Certainly has an uncomfortable ring of familiarity, no? DN, you should be ashamed of yourself!!! You are really low! It’s “Stephenie” Meyer. I’m surprised that there’s no copyediting in this article, apparently. Unfortunately, publishing in Germany goes wrong. As in others countries in Europe, people acquires less and less books. Pricing is obviously higher than the reality of market. Others cultural goods offers more attractiveness for the customers than books. We can observe the part of books in household spending has decreased hugely (divided by three) during the last years. Law of a single price for each book was not ordered for having an luxury market of expensive items but only to give a chance for little shops in downtown to survive at the competition with retail markets biggest companies. At the end, publishers have commit suicide because of an excessively high pricing. Really sorry to break down your dream. A very well reserached and very well written piece – thank you for that. It is indeed a wonderous thing, at least to Neoliberals, that what they would call a price fixing cartel serves to benefit everyone involved: The retailers, producers, authors and readres alike. One of the commentators said that publishers sell their books at higher discounts to larger retailers. This is not quite so: The German law on retail price maintenace (rpm) allows a certain leeway, but not in a way that would allow the big guys to outgun the smaller competition. Where we see marked differences is in the marketing spending: the big retailers demand and get hefty fees for preferred display locations within the shops. Prices have not risen too far over the past 30 years, the period over which I have been involved in the trade, Hardcover fiction hardly ever goes beyond 25 Euros, quality paperback sticks around the 19 Euro mark, mass market sometimes,but not often breaks beyond 12 Euros. Over this period, inflation has outpaced book prices quite severely – in fact, books today are relatively cheaper than they were 10, 15 years ago. Rpm has also been beneficial in that it has kept the huge retail conglomerates out of the book trade: the German brothers of Walmart or Tesco cannot lure people into their outlets by using books as loss leaders. Another commentator said that reading has shrunk as an activity in Germany – this is not borne out by the data. Yes, people have migrated in some ways towards the internet and TV, but reading has been staying in the top 10 leisure activities for donkey’s years and there is no reason to believe this will change dramatically. As for eBooks: It is not rpm that slows down the adoption of electronic reading – it is the relatively small number of titles available (approx. 80.000) , combined with a certain cultural conservatism, that has limited the rush to buy eReaders and eBooks. Currently the maket hovers around 1 per cent. I do read eBooks and find it a pleasant experience, but I do not think that eBooks have an intrinsic value that would oblige us to switch from paper to screen. And a last comment for our friend harping on about the “German Solution” – Get a Life, saddo! Hi Holger, well, you got a point about the rest of the USA = everything outside of NYC. I guess I have been around in this country quite a bit. And yes, “outside” it’s just very astonishing. I have not been to Bad Berleburg though. But I have recently visited a very backward family in the Bavarian Woods, no internet or smart phones and such. But they did believe in evolution. AND they were reading books!!! 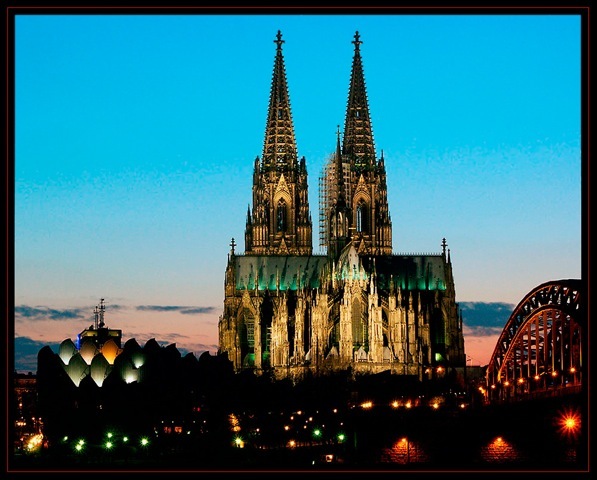 By popular demand, the image accompanying this article is now the Cologne cathedral. Enjoy. Pingback: 1. READ. LOOK. THINK. | Jessica Stanley. So – you’ve seen one gothic cathedral, you’ve seen them all, eh? Well, you must be a quintessential fool. The German publishing industry..so robust, so stable? Ask the smaller presses and publishers of literary merit, those that don’t derive their profits from translating bestsellers, and you will hear an utterly different story. It’s entirely possible that I’m a quintessential fool, or maybe my subtle American wit is lost on you. When I wrote “you’ve seen one Gothic cathedral, you’ve seen them all,” I was taking a dig at Ronald Reagan, who, when he was governor of California, remarked, “You’ve seen one redwood tree, you’ve seen them all.” Sorry if my attempt at irony got lost in translation. On a more serious note, I did talk to smaller presses and publishers of literary merit in Germany who don’t derive their profits from translating bestsellers, including venerable Taschen Books in Cologne, and the story I heard was the story I wrote. Maybe you known something I don’t know, or maybe we’ll have to agree to disagree. At any rate, Vielen Dank, dass Sie The Millions lesen. Please keep reading! As an American who buys only a handful of books a year but devours library books, I would have liked to see some comparison between public library systems in Germany and the U.S. Can anyone speak to the similarities and differences and how those impact the respective reading cultures in each country? Wonderful article and a great discussion. While a wholesale adoption of the price regulation of books may not fly in America, I certainly wish we could take a page (so to speak) from Germany and figure out ways to honor and support young authors and independent booksellers. Also, I just happened to come across a book published by Taschen Books (here in North Carolina, no less – it was Walton Ford, the artist) and it was an quite an experience. Could be a whole new revolution in publishing (and an end run around the ebook) if books (from novels to cookbooks) resembled works of art more than they do now. Thanks for your words, Mr. Morris. As another German stumbling upon this very interesting article, which so nicely documents what is wrong with an all-out capitalism in America, I would like to apologize for the harsh words of fellow countryman Mr. Schwarzer. An unfortunate case of German rudeness that can only be pardoned by his obvious passion for the print industry and frustration with the way things are going. After all he does have a point. However, he should have never ever called you a fool, of course!!!! Thanks for treating him so civil in spite of it. On the other hand, yes, the “seen one, seen them all” comment was probably lost on most of us (Reagan after all has been dead for some time, and our memories are so short) and did sound like the typical “uncultured” thing an American would say. The Koelner Dom really is spectacular :-) But it made for a good introductory sentence, I guess. It was nice to see this cultural comparison, because Americans seem so rarely able to admit that things are better elsewhere indeed (god’s own country and all that ….) They sure are, but as a German-American I too bemoan the demise of Borders. Best wishes! You may not be aware of the term “German Solution” as it was used during World War II. It referred to the “Final Solution” of annihilation of the Jews. Hence, DM here was a bit perturbed. Where did you get this guy Morris? He’s all over the place. and insightful as hell with the research to back it up. Thanks for the journey into the Tutonic style, something we “Amerukans”would do well to immulate, if we could dial down the gagetnalia of our quotidian rat race. Nice work Mr. Morris. Now how about moving on to China and letting us know how the bookish world is there. And then maybe the Arab world: I understand Naguib Mafuz (sp?) more or less invented fiction in Egypt a few years ago. I guess I should say Egyptian fiction. The “net book agreement” was abolished in the UK in the late 90s for a reason. In fact even despite the demise of the NBA, the volume of newly published books has risen continuously in the UK. With today’s increased competition from online retailers and e-books, many Germans turn to book shops from other European countries such as Book Depository (UK) or Amazon.co.uk where they are not ripped off but enjoy discounts of up to 25%. fixed book price law, but the big chains! Big chains do receive discounts from publishers which is not prohibited by fixed book price agreements or laws. So it’s actually a very poorly implemented subsidy that privileges select few.